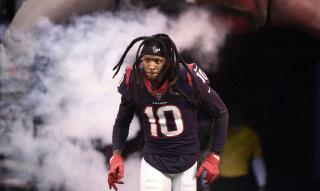 (Newser) – Houston Texans star DeAndre Hopkins will collect $29,000 this weekend for his team's playoff game against Indianapolis. Hopkins, however, said Thursday that all of that money will go to the family of Jazmine Barnes, the 7-year-old girl killed in what appears to have been a deliberate attack by the driver of a pickup, reports ESPN. "When I see Jazmine Barnes' face, I see my own daughter," Hopkins tweeted. "On Saturday, I will be playing in your honor, Jazmine." Meanwhile, a separate reward for information leading to the whereabouts of the driver has risen to $100,000, reports the Houston Chronicle. First, DeAndre, I love your decision. However, you MUST plan for your future and for your family's future as we have a couple problems: inflation and we can not plan of today's income being there tomorrow. Save and invest in property and if wealthy THEN do what our beautiful Oprah does! What doesn’t Shaun King see a racially motivated?